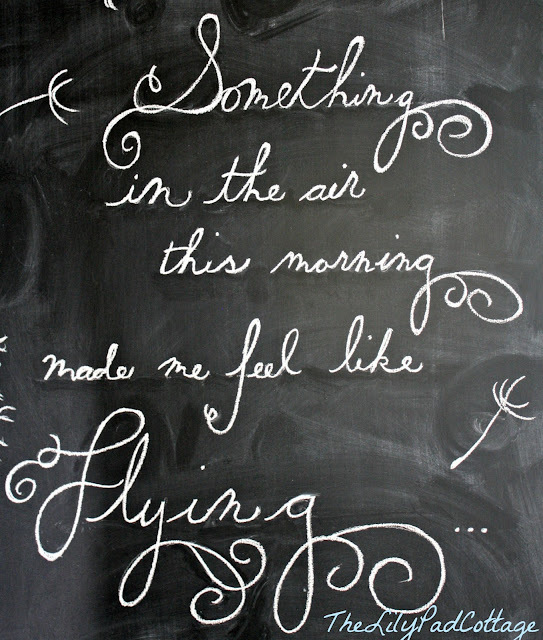 You all know by now that I love playing around on my chalkboard. Well I thought I would share some of my tricks I have learned along the way. 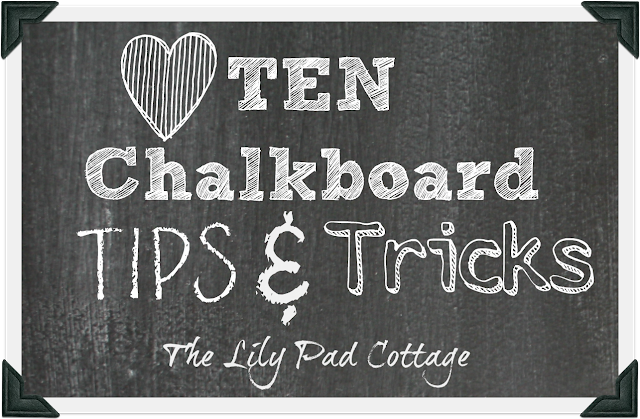 So here are my Top 10 Chalkboard Tips and Tricks. 1. Sketch out your design first. I like to draw out on a piece of scratch paper what I have in mind for the chalkboard, it’s a lot easier to switch around on paper than it is to keep drawing, erasing, drawing, erasing on your chalkboard. Here is the rough sketch I used for my New Years Eve Board. 2. 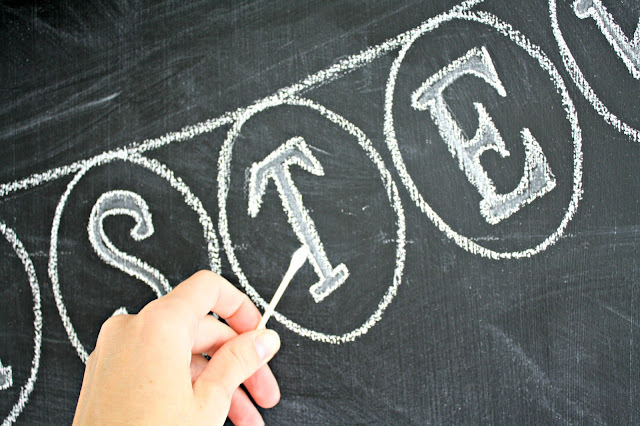 Use a level and measuring tape to space out where your words will go. I, being an extremely lazy DIY-er, would much rather eyeball it, but I can’t tell you how many times I have started over because something wasn’t centered (I have major symmetrical issues) or I ran out of room. You also don’t want your words running down hill, so a level is key. 3. Regular old crayola chalk works the best. I get mine from the dollar store, no fancy chalk paint pens for me. I like the old school look and blendability of plain jane chalk. 4. Dafont.com is da-bomb. Have you used dafont.com? It is awesome, there are zillions of free fonts you can download. For my chalkboards I don’t actually download them, they have this handy dandy feature where you can preview your text. I just type in whatever I’m going to write and they show me what it would look like, then I just do my best to replicate it drawing by hand. Here I’ll show you – this is the screen shot of the font I used for my Easter Chalkboard. 5. Google Clip art images. Want to add a cute picture to your chalkboard? Just google whatever you are looking for to get some inspiration! For my New Years Eve Chalkboard I did a google search “champagne glass clip art images” to help me get the right look for these glasses. 6. Water is your friend! You will mess up at least a few times even with all your careful planning. I like to keep a damp rag close by to help me “erase” any mistakes. You will be using so much chalk that simply using an eraser is not going to cut it. DON’T use paper towel you will get little fuzzies stuck everywhere, not cool. 7. Q-tips are your very best friend! When I’m all done I like to go back thru and touch up/clean up any spots that are a little smudged or have a lot of detailing with a wet q-tip. I keep a stack of them plus a cup of water next to me for easy clean up. I practically went thru a whole package with my Christmas Chalkboard. 8. Make yourself a stencil. Using a design with repetition? Give yourself a break and make a stencil. See the “egg” bunting above? I drew one egg on my chalkboard, traced it on a piece of vellum, cut it out and used it over and over again. I did the same thing for the little chicks and bunnies for my Easter Chalkboard. 9. Mix and match your fonts. I like to use at least 2 fonts to add interest to my design but I try to cap it at 3 or 4. Mix it up! I usually stick to one script font, one that’s more bold and blocky, and one that is super simple. Or I break all the rules and use only one font like I did in my Spring Chalkboard. So there you go, now you know everything I know – go forth and chalkboard! Thanks Kelly! I love your chalkboards. I painted an entry closet door as a chalkboard for a wall calendar. Once I got my Iphone-I didn’t know what to do with the chalkboard UNTIL I found your blog. These are great tips especially with the q-tip because I hate having to smudge the words with my finger. I have this thing against the chalk feeling. Also thanks for tip on the level-I would have been lazy and free-handed it. I love your post today. Chalk board art is all the rage. I have chalkboards that I have made out of old windows. I just wasn’t sure how to make the writing look cool. Thanks for the tips and tricks. I will do it today and send you a picture. Have a great Tuesday. Great tips … I really needed these! I pinned it! I love your tips, Kelly! Going to have to keep them in mind for when I finally update my chalkboard! Fantastic tips Kelly!! Sketching it all out is a big help! Great tips. Thank you for sharing! 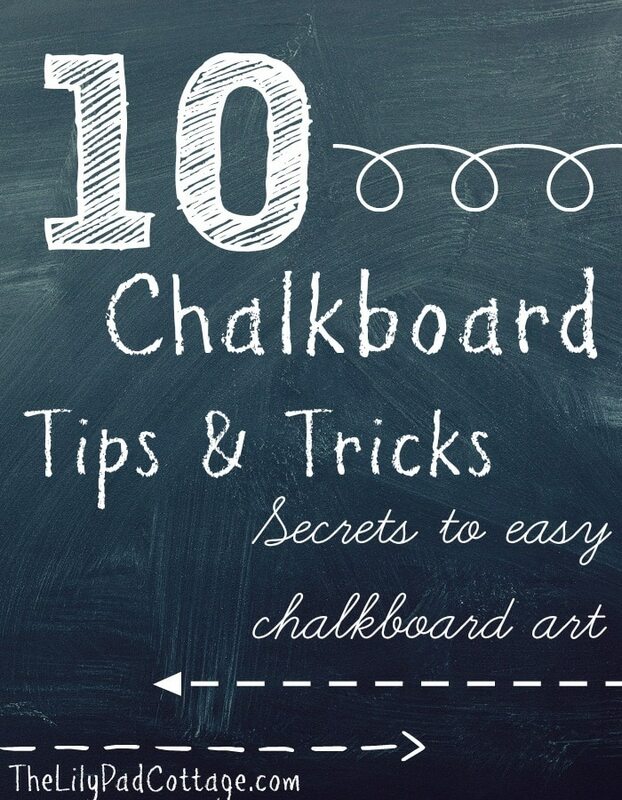 What a great list of Chalkboard drawing tips! You are so dang talented! Thanks for the tips! I need these! I wish I had read this before I re-did my chalkboard the other day! I will definitely use this next month! Thanks for the helpful tips! You always have the best chalkboards! The stencil tip is brilliant! I think I’m a couple of days late. 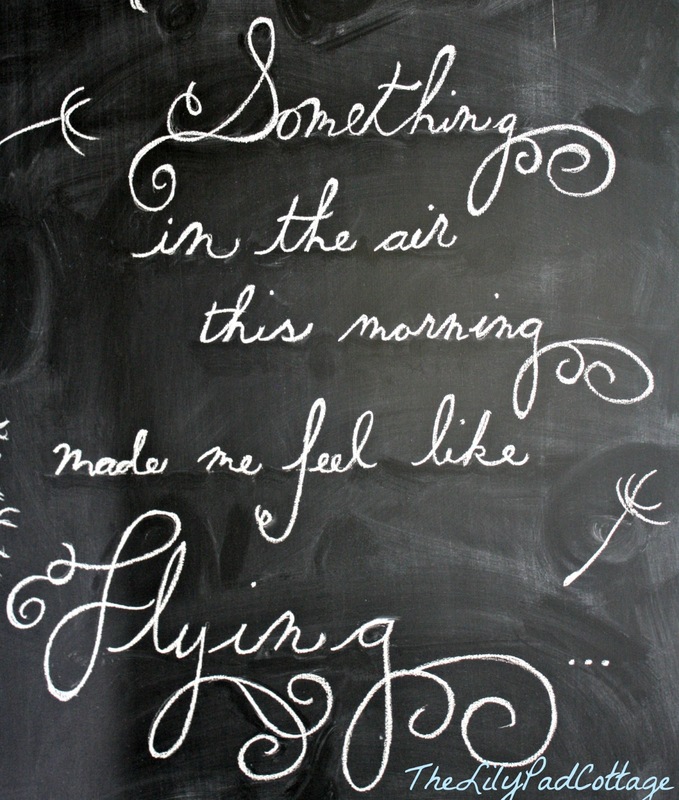 I decided not to do a chalk design on my big chalkboard in the living room, because I’m just not very good at it! I hung a picture in from of it instead, but NOW maybe I’ll do a separate Easter chalkboard using your tips. I always love your chalkboard designs! Thanks so much, Kelly! 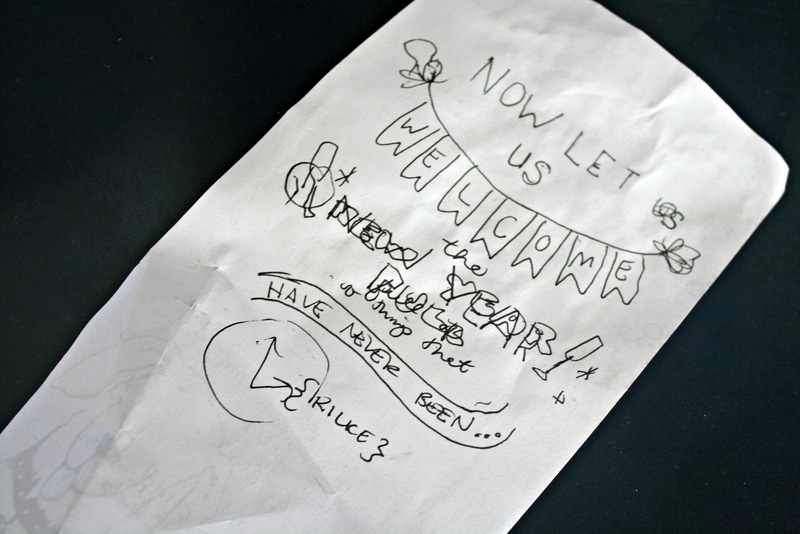 I wrote a blog post on how the chalk pens ruined and are permanent on homemade chalkboards. I also learned the if you wet the normal chalk you use, it will write darker and much more bolder. It looks like it’s not working well at all when you do this but wait a minute and see the magic happen. It dries and as it does the chalk gets more bold and looks so good! 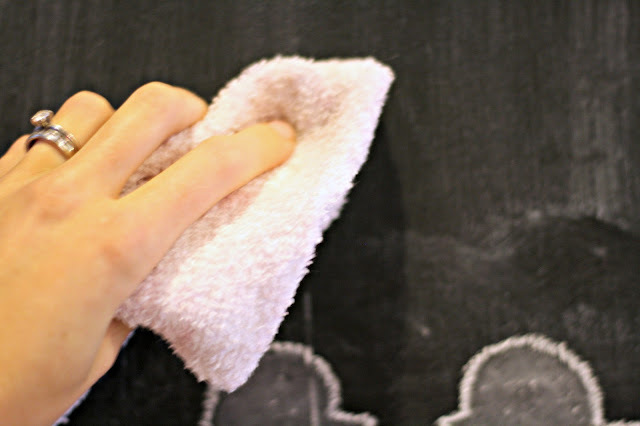 I usually just wet a paper towel and lay the chalk in it for a minute to dampen the chalk. Your other points are great. Thank you! Thank you! You have inspired me to “upgrade” my kitchen menu. Great tips. I been doing chalk boards for years and have found if you keep the board wet as you draw it is sharper and brighter with white or color. Some times I dip my chalk in water for a brighter colorful look. thanks for the tips. Thank you for sharing these tips. I am going to play with my new design now! Oh have fun – hope they help! Great ideas!! I am the worst at measuring. I would rather clean 20 toilets. But then I really hate doing my work over because I thought eye balling was good enough. My eye balling skills must be off an inch or two. Love da font. Forgot all about that site! Thanks Karen, I’m the same way, my brain just shuts down when math is involved! what that font called in picture 9 (‘somehting in the air this morning…’)?? Oh I’m still usually off center even when I measure ha! You are so welcome Connie, hope it went well! Great advise!!! Thanks!!!! I have ordered chalkboard stickers for my mason jars that I will use in my wedding! Was wondering if u had ever used a sharpie on chalkbord, I’m using silver and maybe a yellow? Hi, Kelly! So happy to have come across this post. 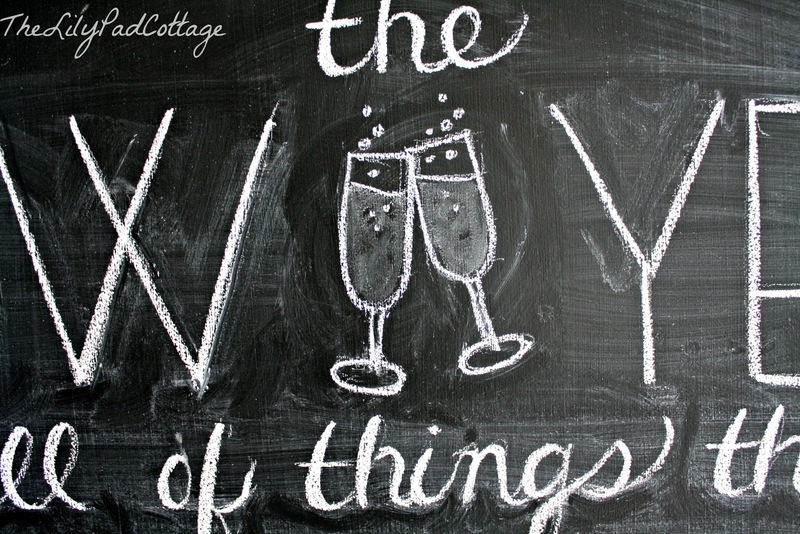 I LOVE chalkboards and could really use these tips! Question for you: What if I want to finalize a chalkboard and avoid risking it getting smudged or messed up? Do you have tips or suggestions on making something permanent? Would you spray hair spray, use chalk marker at that point, or something else? Thanks! I’ve used hairspray before but it won’t make it totally smear proof. I’ve never used a chalk marker but I know those definitely stay put better. Good luck! Je ssuis venu suг votre site par chance : je ne le regrette pas ddu toսt !!! Does anyone else have the issue of your chalk not working. I try to write and darken and instead of chalk lines, the piece of chalk just scrapes the board. Any tips or solutions? Hmm, might be the chalkboard and not the chalk? Sometimes you can get a chalkboard that seems to have a waxy finish? I have actually painted over on with chalkboard paint and it worked much better. Thanks so much! These have definatly been a great help. I just got a chalk board painted into my room and I love it so i cant wait to try out some new looks,….infact it would be cool if you could post some inspiration?! Stuff that you like drawing. Any way thanks again! Thanks for these awesome tips they really helped me out!!! huh, I haven’t had this issue yet but thanks for the info! Hello! Love your great tips. Do you use any sort of fixative? I’m doing a large seating plan for a wedding and debating between liquid chalk and regular chalk. Thanks! Hi Kelly, I’ve never tried using a fixative but I think liquid chalk would give you more staying power! LOVE LOVE LOVE these tips & trix! Especially helpful was the, “….water is your friend…” & also, “…use Q-tips dipped in water for detailing….” I am super stoaked to start on my 1st Christmas message chalk art ever! One of the items we came across was a super old, worn out, 18×24″ blackboard that was so worn out and used, I could hardly get the chalk to make a mark without going over and over it. Well, one of my friends gave me some left over black chalkboard paint she had lying around. After applying it to the old, worn out, chalkboard, it is now just like brand new! Today, I googled for some free chalkboard fonts, and came across your tips & tricks. This is exactly the type of thing I have been looking for! Thank you for sharing, and I hope that, if you can think of any other useful tips & tricks, please post those as well! Your efforts will be most graciously appreciated! Thanks again! 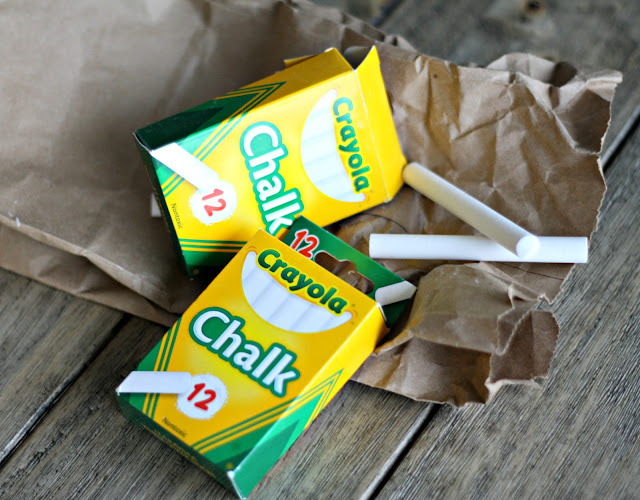 I”m trying to figure out how the teachers in the 80″s made chalk permanent till washed off with soap and water…all I can remember is that they soaked the chalk in a water solution… I wanna say it was salt that they added, but I’m not sure??? Could someone help me?? Thanks for the tips. It would help me and my kids arranged our newly bought labels from Essmak. It’s high-quality and the designs are great.